"Tapestries of Exotic Gemstones" is how jewelry designer CL Schneider describes his work. Featuring uncommon and gorgeous gemstones from around the world, Schneider's jewelry designs are each an orignal handcrafted work of art. CL Schneider's jewelry varies from earrings and bracelets, to more complex, ornate necklaces. In addition, like our custom wallpaper service, CL Schneider designs custom jewelry pieces for clients based on their specifications. We love the look of the stones Schneider uses, which often contain colorful striations and interesting textures. In particular, one stone he utilizes that we love is labradorite, which varies in shades of blues with some purple undertones. We used a macro shot of labradorite to put together the custom wallpaper design we're featuring in the inspiration room. 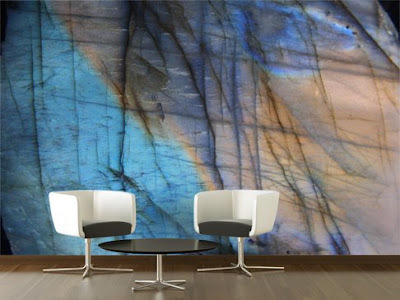 The bluish-purple gradients running through the mural emulate the beautiful stones Schneider uses, and if you love the way this stone looks on the wall as a mural, you'll definitely love it as a piece of heirloom jewelry. CL Schneider uses host of other gemstones that may inspire a custom wall mural: coral, pearl, lapis lazuli and garnet to name a few, offer a rainbow of colors that will coordinate well with a variety of color palettes. Consider an onyx wall mural in a sleek living room, or a jasper mural as an accent wall in a powder room. CL Schneider's website was also recently updated, and now features a line of pendants called DreamStones; learn about each stone's metaphysical properties and uses. Please check out his new site and his incredible jewelry collections, you will certainly be inspired by his work.